Ningaloo is a Hanse 385 sailing yacht. Launched in 2015, this blog is intended to describe our voyages aboard her. 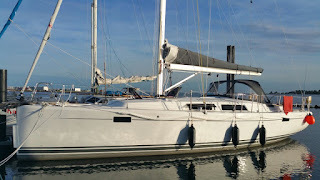 Ningaloo is a Hanse 385, built in December 2014 and launched in May 2015. She is named after Ningaloo Heritage Coast in Western Australia, one of our favourite places. A feature of the Hanse is the self-tacking jib which eases sail handling. All lines are lead back to the two winches near the steering positions making it easy to sail single handed. For light winds we have a 90m2 asymmetric by Saunders. A 27hp Volvo-Penta D1-30 with folding 2-blade prop drives the hull. Electronics are state of the art B&G with a multi-function device at the helm and repeater instruments and autopilot. The cabin has a non-standard layout with two side seats and centre chart table. A single aft cabin allows a larger galley and voluminous cockpit locker.